I've been in plenty of cities where one sees cranes nearly everywhere. In Europe and Hong Kong, there's constant scaffolding draped around old buildings as repairs and additions are made. But, I've never seen as many active cranes and construction crews as I have here in Riyadh. Hundreds of large commercial, industrial, and residential buildings are underway. Thrown into this mix is one of the largest metro projects in the world. Nearly every major street has metro stations under construction or is scheduled to have one in the near future. Every empty field, and there's not many, has equipment in place to begin work on something or other. Pashtun workers (a mix of Pakis and Afghans) are laying the foundation for the extension of a strip mall running along the street of a residential neighborhood. There's very little zoning in place in Saudi. Residential neighborhoods are adjacent to small workshops and kitchens (take-away cooking venues). Mosques are being built alongside these neighborhoods. There's a policy (don't know if it is real -- but I've been informed that it is) that states no Saudi should have to walk more than 400 meters to go to a mosque. And there you have it...the reason that there's 82,000+ mosques in this country, and that number is growing by the minute. Back to the commercial sector. 30 years ago, there wasn't a skyscraper to be seen in the Saudi landscape. That all changed in the last few years. Now there's a bum's rush to stand-up more commercial buildings than could possibly be filled by tenants. There's a glut of new and empty commercial buildings everywhere along the major highways in Riyadh. Here is one example. Nice building surrounded by, well, nothing. The building is ready for tenants but has no takers. Century 21 signs are found almost on all empty commercial buildings around the city. They must have convinced someone that they could fill these empty spaces. They have a major challenge. As soon as one major building is raised, there is a newer one next door that promises to be bigger and better. And who doesn't want that? 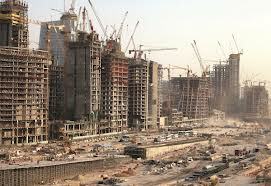 Besides the metro, one of the largest construction projects underway is the King Abdullah Financial City. This is a planned financial center just north of downtown Riyadh that will contain most all international banking organizations and financial groups. I guess the idea here is to compete with Dubai for control of the financial transactions happening here in the Middle East. This complex will be served by the new metro system. The architect's renderings make it look quite nice. Here's the thing. There's 34+ buildings all going up simultaneously with more cranes and construction vans in use than you can count...before you lose count. 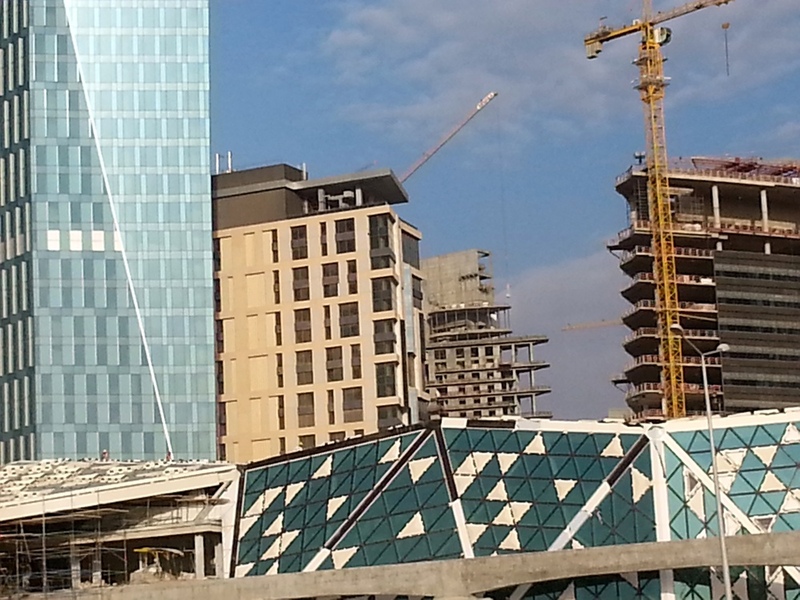 It's an incredible building extravaganza that is hoped to be complete before its namesake -- King Abdulla -- dies. Here's the other thing. There's next to no public services being constructed. No parking lots, no public restrooms, no restaurants, and certainly no bars! The philosophy was, build it, and people will find a way to get there. Uh...no. And the hope that all the existing banks and financial groups will vacate their current locations and move to this new facility with no facilities leaves me a bit perplexed. Let's say they do. Let's say that the international banking community all decide to move to the new Financial City. That would increase the empty commercial office space in Riyadh by an exponential amount. Downtown Riyadh would become a ghost town. Here are some shots taken of the ongoing construction. The first shot I pulled off of the Internet to show an earlier stage of construction. Met a guy here a couple of weeks ago who helped me understand what is going on. He's a Pakistani American architect from LA. He's been here for five years working architecture, but now specializes in commercial real estate. Once I found that out, I hammered him with questions. And he had lots of interesting answers. Wise business men years ago bought up lots of available, vacant land at next to nothing. Now, with the explosion of population growth in the city and influx of overseas businesses into the area, land values have risen by thousands of percent. Those who own land are sitting on a gold mine. The catch is, the 7,000+ princes in the kingdom also own land here and there, but eye what's going on. There's no title searches like we're used to in the west. If you own it, you'd better build on it or someone, especially one of the disenfranchised princes will make claim to it. The only way the landowners can claim to own the properties they've held for years is to show a paper trail of money tied to construction and occupancy. If the Saudi government has issued building permits to you, you now have enough proof to stave off the hungry wolves trying to steal your precious property. And so it goes... in with the new and out with the old.